While most homeowners don’t think about it, the reality is nearly 90% of homes in the United States have a hard water problem. That means millions of families are dealing with hard water and don’t even realize it. The solution is quite simple – you can use water softeners to reduce the hardness(ie mineral content) of the water in your home. In this post, we’ll talk about the best water softeners for your home, RV, and any use you can think of. What Is The Best Water Softener Alternative? What Are Water Softeners Used For? How Does A Water Softener System Work? 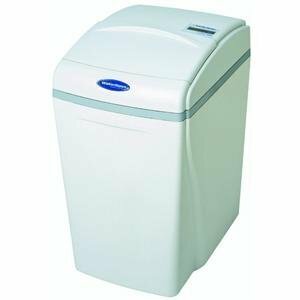 What Does Grain Capacity Mean In a Water Softener? 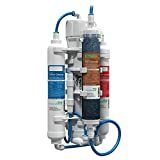 What Size Water Softener Do I Need? How Long Does It Take To Install a Water Softener? How Long Does A Water Softener System Last? Are Water Softeners Safe To Use? Question #1 – What Kind Of Salt Should Be Used? Question #2 – How Do You Turn Off A Water Softener? Question #3 – Do Water Softeners Make Water Safe To Drink? Question #4 – How Much Salt Do Water Softeners Add To Drinking Water? Question #5 – Do Water Softeners Remove Chlorine? Thankfully hard water isn’t necessarily harmful to your health. It can however have a negative effect on various aspects of your life. Hard water can ruin all the pipes in your home. As a result the appliances in your home will no longer be able to work effectively. Having to replace pipes and appliances can prove to be extremely costly and something you would rather avoid. Hard water can also have a negative effect on your skin and hair leaving them both very dry and dull. This can be a huge problem if you work in an environment where you always need to look your absolute best. Just imagine having to give a presentation at work and your hair looks like you haven’t combed it in 3 months. That’s not a good feeling and it could completely ruin your presentation. The good news is fixing your hard water problem isn’t as difficult as you may think. All it takes is a good water softener and you will be good to go. Once you have the right type of water softener your pipes will be protected and you will no longer have to worry about clogged pipes, scaling and unwanted water leaks. Now before you can pick the right water softener you must first understand what hard water is and why using a water softener is so important. And that’s what this guide is all about. After you finish reading it you will be armed with the knowledge needed to pick the best water softener for the hard water problems you are dealing with in your home. Below, you’ll find a quick comparison of our favorite water softeners. We’ve actually reviewed 15 in this post, but we also selected some really special ones below. Now that you understand what water softeners are, how they work and how to maintain them, let’s discuss some of the best whole house water softeners on the market. 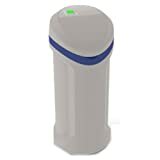 If you are looking for a water softener with a great flow rate, you will absolutely love the USA Fleck 9100SXT Water Softener. With a flow rate of 20 gallons per minute you will never have to worry about not having enough soft water in your home. The great thing about this water softener is the fact it comes in four different sizes. That means you have the ability the choose the one that provides your home with the best flow rate and hardness capacity. This salt water softener comes with two separate tanks. One resin tank and one salt reservoir. Both tanks vary in size depending on the version of the system you choose to purchase. The salt reservoir for the smallest version of the system is 14 x 25 inches and 15 x 35 inches for the largest version of the system. The smallest resin tank is 8 x 44 inches and the largest one is 12 x 52 inches. Mounted on top of the system is the controller unit which adds to the height of the system. This system also includes basic parts for the plumbing connections in your home. Being that this system comes in 4 different sizes the flow rate will be different for each system. The smallest version has a normal flow rate of 5 gallons per minute. That goes up to 7 gallons per minute. The smallest version has a hardness capacity of 26,000 grains. The largest version of this water softener has a normal flow rate of 17 gallons per minute with a peak flow rate of 20 gallons per minute. The largest version has a hardness capacity of 70,000 grains. And again, being that there are 4 different version available, finding the one that works best for your home should not be a problem. Please note this system requires a drain for the used brine solution and electrical power for the regeneration controller. The regeneration controller gives you the ability to control when the regeneration process takes place. You can set the start time, time of day and the hardness of the source water. This way when the unit reaches a certain capacity it will automatically start the regeneration cycle. Depending on the size of the unit you choose to invest in, you can expect to use up 20 pounds of salt during each regeneration cycle. During periods of heavy use you will be able to manually initiate a regeneration cycle. The USA Fleck 9100SXT Water Softener comes with a 5 yr warranty on the valve and 10 yrs on the tanks. If the softener is used to remove iron or magnesium from the water the media warranty will become void. It will also become void if you use the system with water sources that have a high concentration of chlorine. Like most other water softeners the WaterBoss 700 22,000 Grain Capacity Water Softener can remove both calcium and magnesium from your water supply. The one big difference however is that it can also remove clear water iron. Since this is a salt water softener it uses the ion exchange process to trap the minerals that cause the water to be hard. It can remove up to 10 parts per million of clear water iron and can treat water that has a hardness of up to 70 gpg. And thanks to its 22,000 grain capacity it can trap up to 22,000 grains of hardness before needing to go through a regeneration cycle. Acting as an additional filter, the resin media will also trap sediment particles and prevent them from entering into your homes plumbing system. At its peak this system has a flow rate of 12 gallons per minute. Like any salt water softener, this system must be connected to a wastewater drain and an electrical outlet in order for the regeneration cycle to function. The regeneration cycle is responsible for purging any calcium or magnesium that has been trapped in the system. It also flushes out any sediment that has accumulated over time. Typically it will take around 19 minutes for the regeneration process to be complete. During the process the water softening system will use up to 16 gallons of water and just under 3 pounds of salt. To help manage the regeneration process the system features an electronic control panel. The control panel gives you the ability to set the time of day you want the regeneration cycle to occur. This way you can avoid running the cycle during times when your family needs needs access to water. If necessary there is also an option for you to start a regeneration cycle on demand. Additionally, the self cleaning cycle can also be initiated on demand. The WaterBoss 700 comes with a built in whole house filter that can remove both sediment and dirt that makes it way into your water supply. The great thing about this system is its single canister design. Because of the way the system is designed it has a very small footprint. It can hold up to 120 pounds of salt and comes with a three year parts warranty from the manufacturer. There is also a 10 year warranty on both tanks and the valve assemblies. As far as installation goes this water softener comes with all the parts and valves needed. However, in some cases you may need to purchase additional fittings to finalize all the connections. With the ability to remove up to 140 gpg, the Whirlpool WHES30 30,000 Grain softener has one of the highest hardness ratings of any softener on the market. Add that to a 9 gpm service flow rate and you see why this is one of the best systems for homes with extremely hard water and also the best value water softener. The resin bed can handle up to 30,000 grains of hardness and can recover over grains per pound of salt during the regeneration cycle. To help save space this system has a very simple design consisting of a one piece cabinet. The resin tank is located inside the salt reservoir which can hold up to 200 pounds of salt. When the system is running low on salt there is an indicator light that will turn on letting you know it’s time to add more in. Everything needed to install this water softening system will be included in the box. However, depending on your set-up, you may need to purchase additional fittings to connect everything to your plumbing. Unlike many other water softeners on the market, the Whirlpool WHES30 30,000 Grain softener does not come with water conditioning features that can make the water taste a bit better. The control panel allows you to set water hardness settings, time of day and the start time for the regeneration cycle. The controls give you full control over when the regeneration cycle takes place and ensures its not during a time when your family is using a lot water. For your convenience the system comes with a built in sensor that will trigger the regeneration cycle when indicated by the water use signal. If you set the softener to maximum salt use the regeneration cycle will use around 43 gallons of water to cleanse the media. Both electrical power and drain connections are required in order for this system to go through the regeneration process. Whenever the salt gets too low the indicator light will let you know. It will also let you know the active flow rate which will help you identify potential leaks in your home. To help with the removal of iron build up, this system features an iron removal setting that triggers an additional backwash cycle during regeneration. Besides being able to remove up to 140 gpg from your water supply, the Whirlpool WHES30 30,000 Grain softener can also remove up to 12 parts per million of clear water iron. And with a service flow rate of 9 gpm this system can provide enough soft water for up to five people. This system comes with several different warranties so you can be sure you are covered should something go wrong in the first few years of you owning the system, again reinforcing how it’s the best value. The Aquasana 1,000,000 Gallon Rhino is a water softener that is in a league of its own. 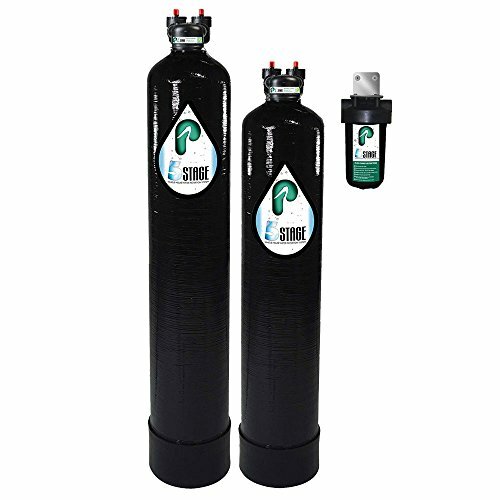 It is a saltless water softener that features a mechanical prefilter and two chemical filters. This combination creates one of the best water conditioning solutions for your home. And the best part is no drains or electrical connections are needed for the base system to function. The system uses various filters to remove things such as algae, bacteria and other unwanted minerals from your water supply. When the water enters the system it will go through a prefilter cartridge where rust and silt particles will be taken away. Once the water passes through the prefilter cartridge it will then make its way through a catalytic media where calcium and magnesium will be transformed into inert crystals. While water treated this way will retain its original hardness value, the crystallized minerals will not form scales which means you won’t have to worry about spots or stains on your dishes. This also means draining for wastewater will be a thing of the past. Unfortunately Aquasana does not provide any guidelines when it comes to how much hard water you can treat with this system. You will basically have to figure it out through trial and error. Once the hard water has been treated it will make its way through two additional chemical filters. The first chemical filter is a copper zinc media bed. This filter is responsible for removing anything that will inhibit the growth of bacteria and algae. The second filter is an activated carbon media filter that removes organic chemical compounds. You have the option to add additional components such as a post filter and a UV filter. The post filter will help get rid of the smaller particles that come in at 0.35 microns. These are the particles that can easily get missed by other filters. The UV filter can help eliminate a variety of bacteria and viruses. The UV filter requires electrical power to operate. Adding it will cause your monthly power bill increase. If you live in a home that uses well water, these two add-ons can prove to pay off big time. All components of this system have a 7 gpm flow rate. If your home is less than 3,500 square feet and less than 3.5 bathrooms, this system will be perfect for your home. With a six year lifespan for the water softener media, and a 10 year lifespan for the main chemical filter, you are sure to have a water softener that will last for many years to come. The pre-filter needs to be changed up to 4 times a year and the post filter, which again is optional, only needs to be changed 2 times per year maximum. Does not require salt, electricity, or back flushing . This salt free, whole home water softener comes with a prefilter that will remove sediments in your water supply. The softener will then kick in and neutralize any minerals that cause your water to be hard. That’s why it makes it our #1 pick for best home water softener. This water softener comes in two different sizes making it perfect for both smaller and larger homes. The largest version of the system has a 15 gpm peak flow rate and the smallest version has a 12 gpm peak flow rate. Both systems include a pre-filter that needs to be changed every six to nine months. When you change it will depend on how often you use the system. Both systems come with four replacement filters in the box. Note this system was designed to be used with municipal water supplies. If your home uses well water you will need to test it for iron, hydrocarbons and hydrogen sulfide before allowing it to go through the water softener system. If any of these compounds are present you will need to eliminate them by pretreating the water. Once the compounds have been removed you can send the water through the system as you normally would. This particular system can treat up to 50 grains per gallon of hard water. That means it can handle some pretty hard water. Keep in mind this particular system does not remove calcium or magnesium from the water supply. It works by crystallizing those two minerals and turning them into stable forms so they won’t bind to surfaces and cause soap to be ineffective. When treated this way the water won’t leave a slippery feeling on your skin that you often get from softeners that use salt. And while this system does indeed prevent the formation of scale deposits, it does not remove any chemicals that can have an impact on how the water tastes. The good news however is you can install the system almost anywhere since it doesn’t require an electrical connection or wastewater drain. All valves and fittings needs to setup the system are including. In some cases you may need to invest in additional plumbing to complete the connection. All Eddy water softeners B00D5YRZLUcome with a 90 day satisfaction guarantee. You will also get a lifetime warranty against manufacturer defects on all parts including tanks and valves. 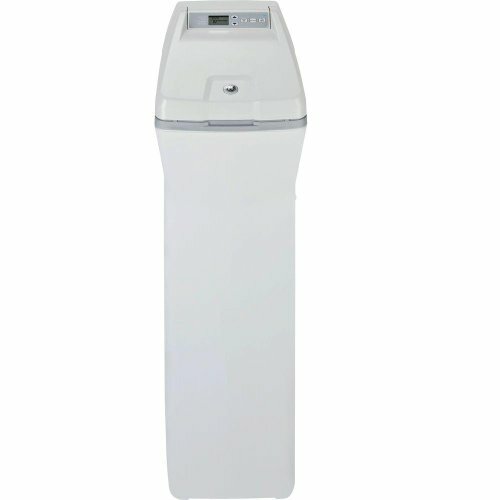 The Eddy salt free water softener is the best water softener for homes using very hard city water. Not only will it neutralize a ton of minerals, but it will also condition the hard water, filter out sediment, get rid of hard water stains, reduce scale buildup and help your cleaning products be much more effective. This salt based water softener uses a resin bed to eliminate the minerals that cause your water to be hard. It also gets rid of clear water iron and features a set of electronic controls that allow you to manage the entire regeneration cycle. This system is perfect for homes with extremely hard water as it has the ability to remove up to 95 gpg and 7 parts per million of clear water iron. It has a service flow rate of 7.5 gpm and the resin bed can remove up to 30,400 grains of hardness before the system needs to go through a regeneration cycle. Being that this is a salt based system it must go through a regeneration cycle a few times a year to ensure the resin beads can continue doing their job effectively. The resin bed is regenerated by flushing it out with a brine solution. The brine solution will remove calcium and magnesium from the resin bed. For every pound of salt used, the regeneration cycle will remove 4,800 grains of hardness. The salt reservoir can hold up to 200 pounds of salt which means you don’t have to worry about constantly refilling it. For every 1000 grains of hardness that gets removed during the regeneration cycle, 2.8 gallons of water is used. Generally speaking one regeneration cycle will use just over 35 gallons of water. Being that this is a salt based system you will need a power connection and a wastewater drain. The power connection will give you the ability to control the unit by scheduling the regeneration cycle to take place at a specific time. You will also be able to set the hardness level of the water which will allow the unit to calculate the resin capacity based on how much water is flowing through the system. Using these two features, the water softener will be able to easily determine how often the regeneration cycle should take place. If needed, there are also additional controls that give you the power to force the system into an immediate regeneration cycle. You can also set a low salt warning alarm so you don’t forget to refill the salt reservoir. This softener comes with several warranties including a limited one year warranty on the system itself, a three year warranty on the electronic controller and a 10 year warranty on both tanks. This softener does come with all the fittings needed for a basic installation. However, in some cases additional plumbing connections may be needed to complete the installation. While the GE 34,000 Grain Water Softener does not come with additional filtration features, it does provide one of the highest softening capacities and can remove clear water iron. This whole house system is designed for medium sized families that consist of a maximum of 4 people. And though its hardness capacity is below average, this system is still about to provide a decent service flow rate of 15 gpm. 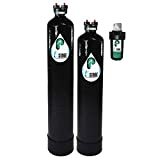 The Discount Water Softeners Premier 48,000 Grain Water Softener is a salt based system that uses a resin bed to remove magnesium and calcium from the water. It can handle up to 24,000 grains of hardness before needing to go through a regeneration cycle. For every gallon of water that goes through the system, 35 grains of hardness gets removed. Make sure you use this value when determining whether or not this system is right for you home. This system also has the ability to remove up to 3 parts per million of clear water iron. Other then that this system does not provide any other treatment or filtration. This is a salt water system which means regular regeneration is required to ensure calcium and magnesium don’t continue to build up and render the system ineffective. The regeneration process does require an electrical connection and a drain line. One regeneration cycle for this system will take about two hours and will use just under 30 gallons of water. For every pound of salt the system uses, 4,880 grains of hardness get removed. The unit can hold a maximum of 200 pounds of salt. The regeneration cycle is controlled by a demand initiated system and a timer. The water flow is measured and anytime it reaches a certain capacity, a regeneration cycle will automatically be initiated. The timer gives you the ability to set the start time of the regeneration cycle at the most convenient time. The best time is usually late at night when very little water is being used. You can also override the timer and force an immediate regeneration cycle. This system comes with a 10-Year Control Head/Valve Warranty and Lifetime on Resin and Brine Tank. If you have a large household the Iron Pro 2 is the perfect water softener for your home. With a 64,000 grain capacity it has the ability to handle any level of water hardness. And thanks to a high flow rate of 16 gpm, this system is able to maintain adequate pressure even when multiple faucets are in use. One of the many things that make this system so great is its all digital fully programmable head. This feature makes using and monitoring the system as easy as pushing a few buttons. To save water the system uses a meter based regeneration process. Being that this is such a big system and it can use over 100 gallons of water for every regeneration cycle it goes through, having a feature that can help you save water is a huge benefit. This is not the type of system you would want to install yourself. If you are new to dealing with water softeners it is best to call in a professional. Cutting pipes and installing fittings is not for amateurs. If you do decide to set it up yourself, be sure to set aside several hours as this is a job that can take quite a bit of time to complete. You should also make sure you read over the manual thoroughly before you get started. 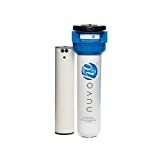 If you prefer a salt and chemical free water softener, the Nuvo DPMB Manor Salt Water Softener System is a reat option. However, just be warned it is one of the most expensive systems on the market. To prevent ions from forming scales, this systems uses a chelation process that binds the hard minerals together. It also reduces how often scaling takes place by reducing the pH levels in the water. If you live in an area with very hard water, the Nuvo DPMB is not the best option for you. Because even after you install it you may still find yourself dealing with a significant amount of buildup. Being that this system does not do any filtering, you should really give it some careful thought before purchasing it. The Krystal Pure KS15HE Water Softener has a 17.5 gpm flow rate which is one of the highest on the market. Add that to its 48,000 grain hardness capacity and its easy to see why this is one of the best softeners for large homes that use a lot of water. This is a salt based system which means it uses a resin bed to get rid of the calcium and magnesium that finds its way into your water supply. It is designed to work with water sources that have a hardness of up to 60 gpg and up to 10 parts per million clear water iron. The Krystal Pure water softener comes with two main components: a salt reservoir and a resin media tank. The way it’s set up, a simple two part layout, reduces the chances of brie flow being blocked by salt during the regeneration process. The one big issue with the layout is how bulky it makes the system. The resin tank sits right next to the salt reservoir which means it will take up a bit more space. With a peak flow rate of 17.5 gpm and a service flow rate of 12.8 gpm, this system can handle the demands of a large household. The system comes with all needed bypass valves and plumbing fittings. However, additional connectors may be needed to complete installation. The Tier1 48,000 Grain High Efficiency Digital Water Softener is able to remove up to 48,000 grains of hardness before needing to go through a regeneration cycle. Please note the system does not provide any water conditioning as far as taste goes. The salt reservoir can hold up to 150 pounds of salt. Each pound of salt has the ability to remove up to 50000 grains of hardness during the regeneration process. Depending on the hardness of the media in the resin bed, each regeneration cycle can last between 80 to 120 minutes. Being that this is a salt based system you will need a wastewater drain and an electrical connection to properly operate the system. With the control unit you can manually set what time you want the regeneration cycle to take place. The best time is late at night when most people are sleep and water isn’t constantly in use. Manually setting the hardness level of the water helps the machine know when it’s reached a certain capacity so the regeneration cycle can be scheduled accordingly. You can also manually set how much salt you want to be used during each regeneration cycle. And if need be you can manually override the system and force an immediate regeneration cycle. All Tier1 systems come with a 100% TIER1 NO WORRIES GUARANTEE. The Fleck 7000SXT 64,000 Grain Softener is another great option for large households. With a flow rate of 28 gpm this system is extremely powerful and can provide water to multiple outlets without the pressure dropping significantly. And with a 64,000 grain capacity this system has enough power to handle even the hardest water. If you have between 6 and 12 people in your home, this is the system you need. It is also great for those who live in areas with extremely hard water. With this system you have the option to choose between a timed or metered regeneration cycle. If you are looking to save water opt for the metered option. While you can install this system yourself, it can prove to be quite complicated. You will be dealing with cuttings and fittings which is something not too many non professionals know how to put together. It is best to either hire a professional or have a friend or family member assist. This is especially important when it comes to adding salt to the resin tank. If your home has very hard water this is the water softener for you. Not only does it have a 34,000 grain capacity, but it also filter out sediment and remove clear water iron from your water supply. Unlike many other water softeners on the market, the Morton 34,000 uses a single tank design. And as with other softeners, it too can remove calcium and magnesium. This system can process up 34,000 grains of hardness before needing to go through a regeneration cycle. It’s safe to say this system can handle extremely hard water thanks to its 120 grains of hardness per gallon. The great thing about the sediment filter is that it is self cleaning. That means you never have to worry about changing it. And best of all, this system is able to work with both well water and municipal water supplies. To remove calcium and magnesium from the water this system uses resin media. When the media is at full capacity, the brine solution will automatically kick in and get rid of any minerals that have accumulated. Any sediment that has been drawn out of the water in your home will also get removed during the regeneration cycle. Note you will need a wastewater drain and an electrical connection for the unit to operate. For every pound of salt that goes through the regeneration cycle, 5,089 grains of hardness gets removed. The control panel allows you to set the hardness of the source water, regeneration time and time of time. Contact your local water provider to find out what the hardness of your source water is. You can also use a home test kit to figure it out. Morton uses a look ahead technology that is able to monitor water usage and automatically start a regeneration cycle when needed. To save space Morton enclosed the resin tank inside of the salt reservoir. The reservoir can hold up to 210 pounds of salt and has a 18 gpm service flow rate. This flow rate is significant for households of just about any size. The system comes with all needed valves and fittings for setup. Morton offers a one year in home service warranty, a three year warranty on electronic components an a 10 year warranty on both tanks. The system is equipped to handle both well and municipal water sources. If you would prefer to avoid having chemicals and salt in your water, the Aquious AQFS220C Full House Water Softener and Filter System is just what the doctor ordered. This salt free water system uses citric acid to change the properties of the minerals that cause the water to be hard. By changing the properties of the hardness minerals scaling will no longer take place when water makes contact with certain surfaces. With a flow rate of 12 GPM, the Aquious AQFS220C is a great option for both small and medium sized homes. You will be able to use multiple faucets at the same time without a noticeable loss in pressure. The great thing about this system is how easy it is to install. Even if you don’t consider yourself a DIYer, you should still be able to get everything set up and running without needing to hire a professional. One thing to keep in mind is that this is not a traditional water softener. While it does indeed change the behavior of the minerals that cause the water to be hard, it does not completely prevent scaling. Also, if you have a large home with more than three faucets, this system will more than likely not be sufficient for your home. As far as price goes the Aquious AQFS220C is a bit on the expensive side. However, being that it also comes with a very effective filtering system, the price can prove to be well worth it over the long run. 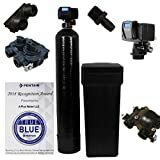 This three part filtration and water softening system is probably the most expensive on this list. But when you look under the hood you will see why it might be well worth the $2,300 price tag. Let’s start by discussing the three parts the system consists of. First is the mechanical pre-filter that helps remove the smallest particles from your water supply. Next is the actual salt free water softener itself and third is a chemical filter which removes chemical compounds such as chlorine. The chemical filter can make the water taste a lot better. 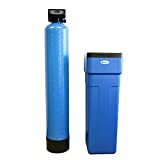 The interesting thing about this water softener system is that it is available with two different output capacities. If you have a smaller home with three bedrooms or less opt for the system with a 10 gpm output capacity. If you have a larger home with four to six bedrooms, opt for the system with the 15 gpm output capacity. Both systems come with all needed valves and connectors for setup. However, you may need additional fittings to properly connect the system to your water supply. The pre-filter requires no electrical power and no drain connection. This gives you the flexibility to install both indoors and outdoors. There are a few things you will need to do with this system to keep it properly maintained. First you will need to make sure you replace the pre-filter media and O-ring seal once or twice a year depending on how often you are using the system. The carbon filtration media will also need to be replaced every 5 years or so. It will need to be replaced based on how many gallons of water have been treated during a certain period of time. Replacing the carbon filtration media can be a bit complicated and will require you to disconnect the filter tank and soak the new media for at least 48 hours. The good news is you will never need to replace the water softener media. Keep in mind this is a saltless system and it does not remove minerals from the water. It simply converts calcium and magnesium into crystals that do not bind together and therefore do not interact with any surfaces. If your water source has a hardness of 75 gpg, which is very high by the way, this would be the perfect system for your home. It will prevent the buildup of scale and make your cleaning products more effective. 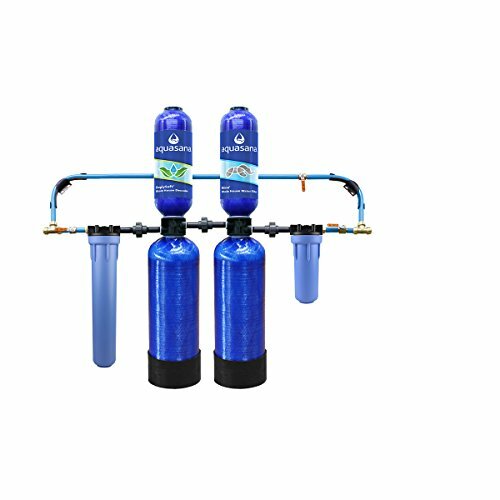 For this system to work your water supply cannot contain any hydrogen sulfide, iron or manganese. If it does you will need to pretreat the water before sending it through the system. If you don’t the impurities could cause the system to malfunction. All Pelican water softeners come with a 90 day satisfaction guarantee. 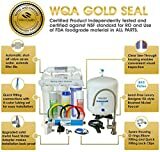 There is also a 5 year performance guarantee on the softener and the filtration system, and a limited lifetime warranty on the parts and tanks. 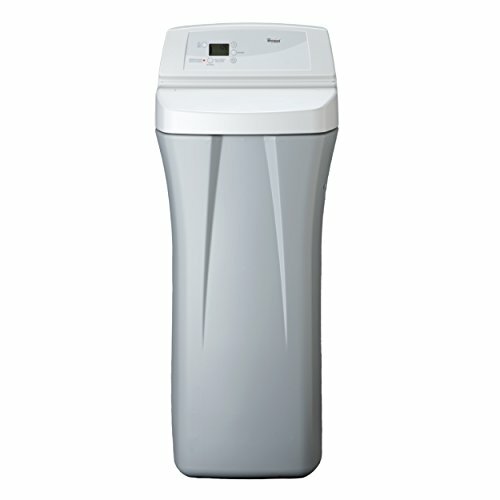 If you are looking for a compact water softener that is great for road use, the Watts RV Pro 1000 is a winner. While it’s not as big and powerful as a whole house water softener, it does indeed get the job done. This system is specifically designed to be used in an RV where water usage tends to be low. And with a 10,000 grain capacity this compact system has the ability to handle even the hardest water. Because the system is so compact, you can easily take it with when taking a cross country trip. It is very easy to use and light enough for you to carry it around with you. However, with such a compact system there does come a bit of sacrifice. This system is pretty much void of any automation which means you will have to manually do all regenerations yourself. The regeneration process needs to take place every 2 to 4 weeks depending on how much water is being used. Besides having no automation, this system is also very limited and can only be used with up to 2 outlets at a time. The flow is too slow to be used with multiple outlets which is why this system will not work for even the smallest of homes. Either way, if you spend a lot of time on the road in your RV, the Watts RV Pro 1000 is exactly what you need. It’s small but extremely effective. Water softeners are made by a variety of companies – some are well known, like Whirlpool and GE, and others are less known but more specialized, such as Morton, Tier 1, and Fleck. There are other brands too but these are the best known, which is why we’ve listed them here. GE, or General Electric is a powerhouse corporation that makes everything from engines to light bulbs. From GE, you can expect the quality standards of GE’s reputation – but remember that this is just one product out of thousands that they make. So they’re not specialized in water softening. The same goes for Whirlpool. They’re not as big as GE, but they still make a wide variety of products from refrigerators to washing machines to water filters. Most of their products however are aimed towards households, so they are indeed a bit more specialized. Morton, the name we’re all familiar with in the salt industry also uses their salt to make water softeners and water filters. Morton water softeners are very good and since they’re in the salt business, they are specialized and know what they’re doing! Morton also offers free technical support which is a huge plus point. Tier 1 is a company specializing in making water filters and water softeners. They make really top quality stuff and their filters and water softeners are really easy to use and install. Tier 1 has an unconditional satisfaction guarantee on their water filters and softeners. Fleck is a USA based company that makes everything from home water softeners suitable for a small family to commercial water softeners in large operations. Morton and Tier 1 are more focused on home systems, whereas Fleck makes both home systems and commercial systems(which can cost upwards of tens of thousands of dollars). 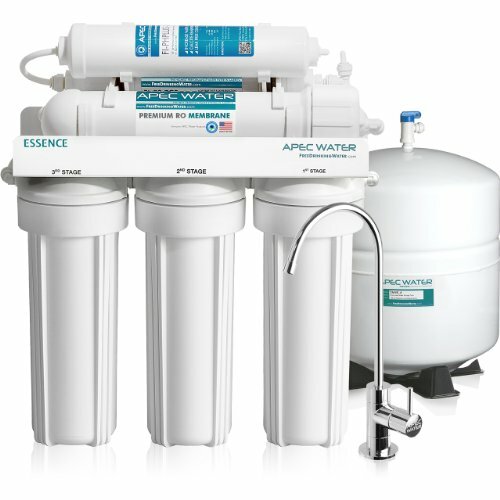 What size water softener for family of 4? Which do you need? If you are looking for an alternative to a water softener you will love the Eddy Electronic Water Descaler. 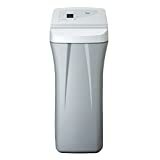 It is very important you note this is a descaler and not a traditional water softener. It uses an electromagnetic field to change how the properties of the minerals adhere to the water as it passes through the pipes. The electromagnetic field actually causes those minerals to bind to the water instead of the surfaces it comes in contact with. This will prevent scale from showing up in your sink, on your faucets and on your dishes. 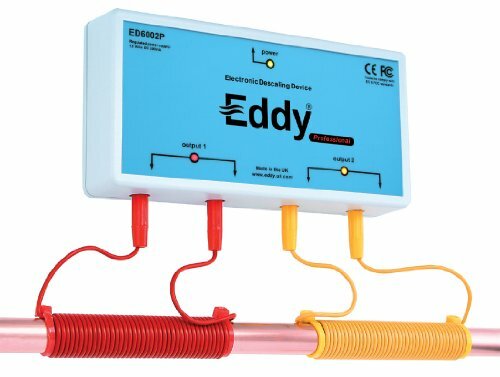 One of the many great things about the Eddy Electronic Water Descaler is how easy it is to set up. As long as you have a power source nearby you will be good to go. Most users have said as soon as they install this system they immediately notice less scale formation. One of the biggest advantages to using a system like this is the fact no chemicals are ever used. You never have to worry about drinking water with a ton of salt in it. As a matter of fact, with a Descaler the water retains all of its minerals. Because of this the water will have a sweeter taste and be healthier than the water you get with a traditional water softener. Please note this system is not waterproof and can therefore not be used outside. If the main entry pipe at your home happens to be outside, you will need to have a hole drilled in the wall so the unit can stay inside and not be damaged by the outside elements. If your main goal is to deal with the scale that often gets left behind by hard water, this descaler is a great option for your home. This concludes our list of water softeners. Below, you’ll find some extra information on water softening: a quick feature guide, installation, maintenance, and troubleshooting for your water softening system. With hundreds of different water softeners on the market it can be quite challenging to find the one that is best for your home. After all, most people have no idea what to look for when it comes to shopping for a water softener. To help make this process easier for you we have outlined 9 things you need to take into consideration when looking for a water softener. What Is Your Budget for getting a water softener? Before you start the process of looking for a water softener, the first thing you should do is iron out your budget. How much are you able to spend? You need to decide if you want to save money by getting a low capacity system or spend more on a more powerful system. The option you choose will depend on the needs of your home. When making this decision keep in mind this is an investment in your family’s health. What Type Of Technology Is Being Used? In a previous section we discussed 5 different types of water softeners and the pros and cons of each. Each one uses a different technology to softener the water. The ion exchange system, which is by far the most common water softener used by homeowners, works by exchanging magnesium and calcium ions with sodium or potassium ions. Salt free softeners on the other hand work by changing the behavior of the ions so they no longer stick to the surfaces they come in contact with. For most homeowners a salt based system will be the best option. If however the extra salt is a problem, opt for the salt free system instead. With ion exchangers you want a system that uses an all digital controller. This will allow you to control and monitor various aspects of the system. When it comes to the type of technology each system uses, its very easy to get caught up in all the bells and whistles and spend more money than necessary. Keep in mind you don’t need every feature. You only need features that will help you get the desired outcome. So take your time and make sure you understand what each technology does before you invest your money in it. Do You Need a Portable Water Softening System or Traditional One? Whether or not you need a portable water softener will depend on how you plan on using it. If you only plan on using the system to soften the water in your home then portability is not of concern. If on the other hand you want to soften water when you are enjoying the great outdoors, having a portable system is an absolute must. While most portable systems have a single tank, they can still be quite heavy with some weighing as much as 40 pounds. This is something you should keep in mind before purchasing a portable water softener. Single or Dual Tank water softener? If you only want to soften water when it’s required, a single tank system is all you need. If you want the water in your home to be softened 24 hours a day you will need to go with a dual tank system. Dual tanks use block salt and require quite a bit of maintenance. Single tanks use granular salt and require little maintenance as they don’t have any many parts as a dual tank. What Is The Flow Rate In Your Home? When you set up a water softening system that means all the water in your home must go through the system before you are able to use it. Once the water goes through the system it will be distributed to the various lines throughout the home. In some cases, if the softener is not able to soften the water quick enough, the flow rate will drop. If you have more than one faucet running at the same time you may experience a significant drop in water pressure. Low flow rate can have a negative impact on your everyday life. It can also lead to hard water bleeding through the system when there is too much demand. Make sure your home has the right flow rate will ensure your family can use multiple faucets without the pressure significantly dropping. While the flow rate will vary from home to home, the average home with 4 to 6 people should have a flow rate of at least 12 gallons per minute (GPM). Larger family homes should have 20 gallons per minute or more. What Is The Water Softener’s Capacity? As we discussed in a previous section, the capacity of a water softener refers to the amount of hard water minerals the system can handle before it has to go through the regeneration process. Ultimately the capacity will depend on the water demands of your home. Big homes will need large capacity systems while smaller homes will need smaller capacity systems. Generally speaking the capacity of a water softener will be indicated in terms of grains of hardness. The four most common grain capacities are 12,000, 24,000, 32,000 and 64,000. The average family will only need a capacity of between 10,000 and 20,000 grains. And while this type of system will require more regenerations, it will also save you money when it comes to operating and maintaining it. Manual water softening or Timed Regeneration? When all the salt has been drained from the resin a process known as regeneration will take place. During this process magnesium and calcium ions will be removed using a concentrated salt solution known as brine. When it comes to the process of regeneration there are two key factors you need to consider. First, is the regeneration process manual or timed? And secondly, how long does the process take? If you opt for a portable water softener the regeneration process will be manual. You will need to manually add salt to the tank and wait for it displace any hard minerals. Timed regeneration means the process will be done automatically. Some systems will automatically start the regeneration process based on water output while other will require you manually set the time. Once the time has been set the system will take care of the rest. The best time to set a timed regeneration is late at night when water is less likely to be in use. Having a warranty might not be at the top of your priority list, but it is something you need to consider. A warranty will protect in the event that something goes wrong with your system in the first year or two. A good warranty will give you peace of mind. How Much Maintenance Is Required for your water softener? Salt based water softeners tend to require more work to maintain. If you want easy installation and easy maintenance opt for a salt free system. When you have hard water it means you have more than 17.1 milligrams of minerals per liter in your water. So in other words, hard water is water that has a high mineral content. Anytime water passes through areas that contain minerals such as magnesium or calcium, those minerals get absorbed in the water and cause it to become hard. Keep in mind these minerals are in no way harmful to your health. They can however cause some of the skin and hair issues mentioned earlier. The biggest problem with these minerals being in your water is that they produce scale deposits. These scale deposits will eventually clog up the pipes in your home and slow down the movement of water. In some cases it will even block the flow of water altogether. When the flow of water has been completely blocked you may find yourself dealing with serious water leaks that are very costly to repair. Besides clogging up your pipes, the minerals found in hard water can also cause problems on an aesthetic level. Have you ever noticed unsightly spots or film on your dishes? Or what about your laundry coming out of the washing machine looking dull and dingy? These are all issues that can be attributed to hard water. When it comes to knowing if you have hard water there are a few telltale signs you should look for. The first and most noticeable would be mineral deposits. Mineral deposits, commonly referred to as scaling, are white spots that are left over once water has evaporated. You will most often see this on your dishes after they have dried. Hard water can also show up as a coat or film inside of your glassware. And as previously stated, over time the mineral deposits can build up and eventually clog your pipes. Another sign you may have hard water is if you find it difficult to get a good lather when you are trying to take a shower. Hard water can prevent soap from being effective as a cleaning agent. This can also happen when you are trying to wash dishes. If you want to know the exact level of hardness in your water, which is vital when it comes to picking the best water softener for your home, you can either request a Drinking Water Quality Report from your city, use a water kit or do the “soap test”. Experts recommend using a water kit as they tend to be pretty accurate. The kit comes with test strips or tablets that change color when they come in contact with hard water. The color change will indicate the level of hardness in your water. The kit will come with a test chart that will explain what each color means. Water kits can easily be found at any local hardware or supply store. If for some reason you are unable to get your hands on a water kit, your next best option is the “soap test”. To do the soap test you will need a clear, 12 oz plastic bottle and some dishwashing soap. Fill the plastic bottle with hard water and add in 10 drops of dishwashing soap. Shake well and see if any suds develop. The richness of the lather is what will determine if you have hard water. Please note this type of test is not nearly as accurate as the water kit test. So now the question is how do you fix your hard water problem? Luckily there is a simple solution and it is a process known as water softening. According to Wikipedia water softening is a process by which minerals such calcium, magnesium and other metal cations get removed from hard water. The result is soft water that is more compatible with the soap you use and less likely to clog your pipes and ruin your plumbing. In order for the water softening process to take place you must have a water softener. A water softener is a pressurized water conditioning device that forces hard water through a bed of cation exchange media. The purpose of this process is to remove hard minerals such as calcium and magnesium ions and replace them with sodium and potassium ions. The end result will be water that is more suitable for use in your home. For many homeowners the taste of hard water is unbearable. As a result they find themselves drinking less water which is never a good thing. With a water softener the minerals that cause the water to taste bad will either be reduced or eliminated altogether. Scaling is without a doubt the least desirable side effect of hard water. Its slimy and can stain anything it touches. Even your skin. 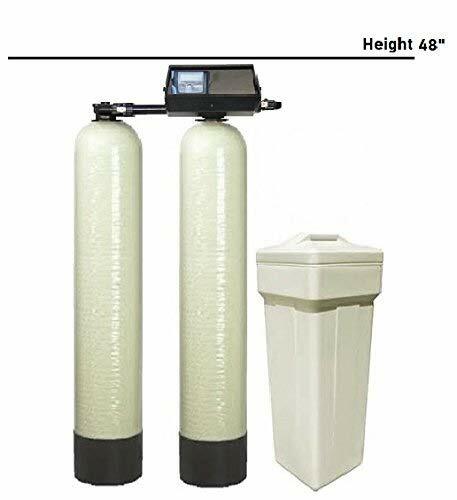 The good news is a good water softener can either greatly reduce the amount of scale build up you have to deal with or it can eliminate it altogether. Salt based water softeners, which we will discuss shortly, are the most effective when it comes to eliminating scaling. If you are looking for a short term solution go with a salt free softener. Over time hard water can erode your plumbing. The problem is you don’t notice it until it’s too late. So over the course of several months or years scale will build up and the result will be restricted water flow and weakened pipes. A good water softener will help you prolong the life of your plumbing. When you have hard water getting a good lather can be quite difficult. As you a result you will end up using more water and more soap. A water softener, depending on the type you choose to purchase, will either remove the hard minerals from the water or change the way they behave. So not only will washing become easier, but you will also save money as you won’t need to use as much water. To make understanding how a water softener system works easy, we have decided to break the basic mechanics of a water softener system into 5 simple steps. In the first step the tank of the water softener system is filled with resin beads. These resin beads are covered with sodium ions and act as a magnet to attract the calcium and magnesium ions that are causing the water to be hard. The calcium and magnesium ions will basically be exchanged for the sodium ions in this step. Step two is a process known as regeneration. Over time the resin beads will become saturated with minerals and will need to be recharged in order to continue effectively removing the calcium and magnesium ions. This recharging process is known as regeneration and can easily be done with the control valve that usually sits at the top of the water softener’s tank. The control valve is the brains of the system and controls everything. This is where the resin beads get saturated with sodium ions. A strong brine solution will be flushed through the resin tank and all beads in its path will get covered in a stream of sodium ions. Soft water is now delivered into your home. You will immediately notice a difference the next time you take a shower or the next time you wash the dishes. This is the final step. During this step the fresh water will flush the brine solution, along with the calcium and magnesium ions, right down the drain. Note the regenerated resin beads can be used over and over again. Grains of capacity is a measurement used to rate water softeners. 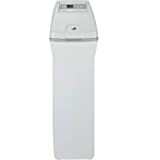 It refers to the ability of the water softener to remove the stated number of grains of hardness from the water supply. The capacity of a water softener will vary depending on the amount of salt needed to regenerate it, as well as a host of other design factors. While it may look complicated, installing a water softener system is not as hard as it seems. As long as you follow the directions we are going to share with you, you should have no problem getting your water softener system setup and running in a couple of hours. To make it easier we are going to break down the installation process into 10 simple steps. Once you have gathered all needed tools the next thing you want to do is read the manual. Go over the important details and make sure you understand them before you begin the installation process. Find the main switch valve and turn off the main water supply to your home. You will then need to unplug the water heater and turn on all the faucets in your home so you can drain any remaining water that is in the pipes. In some cases you may need to use your tools to open all the plumbing fixtures in your home to make sure they are completely drained. You want to make sure there is no trace of liquid inside the pipes as it can interfere with the water softener installation process. Your water softener should be placed in an area that is dry and near a drain. The surface should be level and there should be enough room for two tanks. Before you can connect the water softener tanks you will first need to measure the distance between the bypass ports and the cold water line. Once you know the distance cut a piece of copper tubing to fit it. For this step you will need to refer to the manual as each water softener model is different. The overflow tube should be attached to the water conditioner tank. Both the overflow tube and the discharge tube should be connected to a drain. For this step you will need a screwdriver. The bypass valve should be placed on top of the conditioner’s head valve and secured into place using the clamps. Once you have installed the bypass valve you will need to connect it to the tubing that delivers the water to the valve. Now just connect the water conditioner to the water lines and you will be good to go. Be sure to double check the connection to ensure there are no leaks. Before you can use the water softener you need to make sure everything fits properly. To do this you will need to scrub and solder the fittings. Keep in mind if you solder the fittings you will need apply flux and use a propane torch to melt it. This will ensure every fitting is waterproof. If you don’t feel comfortable using a propane torch you can use Shark Bite connectors instead. As this point your job is done. To complete the water softener system installation process all you need to do is turn the water back on and start the system. Refer to the manual for instructions on how to turn the system on. The great thing about salt based water softener systems is their ability to last up to 15 years. And in some cases, if properly maintained, they can last even longer than that. Some of the things that can shorten the life of the system include issues with the brine tank and inefficiency. Once your water softener system hits the 10 year mark you have to decide whether it’s best to invest in a new one or put money into having it repaired. If the problem will only get worse it’s best to get a new system. As far as salt free systems go, they have the potential to last even longer due to their simple design. How much longer is difficult to determine as each system is different. While most of us have more than likely heard of water softening systems and water filtration systems, very few of us actually know the difference between the two. Understanding the difference between the two will help you better solve the problems you are having when it comes to water quality. Water softeners use the latest technology to help eliminate the minerals that cause your water to be hard. The average water softener will use a resin bed full of resin beads coated with salt. As the water flows through the beads, the beads will attract the minerals in the water. Once the minerals come in contact with the beads, they will attach to the beads surface and salt ions will be released into the water. This is the ion exchange process by which the minerals in the water get replaced with salt. If you are not a fan of salt and are concerned about the negative effects it can have on the environment, opt to use potassium chloride instead of salt as your water softening agent. Not only is potassium chloride better for your health, but it is also better for the environment. The one caveat is price. It will cost you quite a bit more to use potassium chloride than salt. There are also other types of water softening systems that use electromagnetic and magnetic fields to change the form of the mineral ions. While these types of water softeners don’t actually soften the water, they do protect all of your plumbing from scale deposits. Water filtration systems use a variety of different filters to trap particles. The idea is to catch the particles before they make it into your homes water supply. Each filter is different and will trap different sized particles. Some filters are specifically designed to trap larger particles while others are designed to trap smaller particles. While each of these systems do two different jobs, both are equally important when it comes to water treatment. A water softener will ensure the water won’t stain surfaces and a water filtration system will ensure you have clean, healthy water to drink. In one word YES, water softeners are indeed safe to use. The biggest problem most homeowners run into is the extra salt that is being added to the water they are drinking. If you are on a low salt diet drinking too much salt can prove to b a serious problem. The good news is the amount of salt being added to the water is a lot smaller than you think. It really all depends on how hard your water is. If you have moderately hard water chances are you won’t even notice the salt in the water. For most people softened water will not cause any health issues. If you are on a low salt diet it is recommended you speak with your doctor before using a salt based water softener. If they prove to be a problem you can opt for a salt free softener or a potassium ion exchanger. While potassium water softeners can prevent excessive salt intake, the pellets used are very hard to find and are very pricey. Something else to keep in mind is the amount of potassium to achieve the same quality regeneration as salt does. For the most part there isn’t a big difference between how potassium softeners and salt softeners work. Both are safe to use and are effective at removing minerals from the water. Last but not least let’s answer a few of the most commonly asked questions about water softeners. You may be surprised at how many different options you have when it comes to salt. The key however is to get a salt that dissolves well. Salt that dissolves well is easier on the water softener system and will flush away without any problems. Stay away from table and dicing salt as they tend to get stuck in the filter and cause all sorts of problems. This is a great question and one that gets asked quite a bit. The first thing you will need to do is identify which valves are directing the water into the system.Turn those valves so that water is no longer being diverted to the water softener. Once you do this hard water will no longer pass through the water softener before entering your home. To completely shut down the system disconnect the power supply. Water softeners are designed to get rid of most of the impurities and chemicals found in your water supply. So technically, yes, a water softener does make your water safe to drink. However, that doesn’t mean it produces the best kind of water to drink. While water softener water is safe to drink, there will still be people who prefer to drink bottled water or distilled water. It’s all a matter of personal preference. The average water softener adds about 28 mg of sodium per 8 oz glass of water. When you look at the big picture, that is a very small amount of sodium. For most people this is nothing to be worried about as it is not harmful to one’s health. Keep in mind the amount of salt that will be added will depend on how hard your water supply is. If the salt proves to be a problem you can always opt for a salt free water softener. Salt free water softeners do not add anything to the water. They instead conditioner the water using various techniques. After the water has been conditioned it will no longer leave mineral residue on surfaces. A conventional water softener is not equipped to remove chlorine from the water supply. If you are concerned about chlorine being in your water, invest in a water filtration system as they are designed to remove chlorine and a whole host of other chemicals. Hopefully you have found this guide to be helpful. Every product review is based on research and customer feedback about the products. All products listed in this guide can be found on online at a great price. When looking to buy a water softener always take the time to do your research. The last thing you want to do is install a system only to find out it doesn’t meet your needs. Make sure you know the water flow rate, what type of technology is being used, grains of hardness and what all is covered by the warranty. Use the information shared in the guide to determine what size water softener you need for your home. This should be your number one priority when it comes to buying a water softener system. While there are many different brands to choose from, some of the best water softener brands include Fleck, Waterboss, Culligan, Aquasana and Morton. Always remember not all water softeners are created equal. The one you invest in should meet the needs of your household and fit within your budget. If you use the tips outlined in this guide we have no doubt you will find a great water softener that everyone in your family will love. Hi, my name is James M. Clayton. I have grown up with a burning desire to empower people get supply of pure water. I am greatly concerned with the issue of water-related diseases and that is why I came up with this page about Reverse Osmosis systems. Having seen several cases of the infections while growing up, I made a point of enabling people get pure water in their homes.